When a series of Hindu-Muslim murders leads to a citywide curfew, Natraja’s guests unwittingly become her captives. So begins a period of days blending into nights as Natraja and her Indian cook become entangled in a web of religious violence, and their guests fall under the spell of this ancient kingdom–at once fascinated and repelled by the begging children, the public funeral pyres, the holy men bathing in the Ganges at dawn. 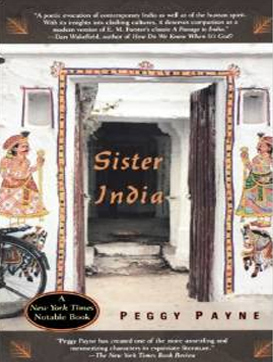 Sister India is a traveler’s tale, a Varanasi novel, about the strange chemistry that develops from unexpected intimacies on foreign ground. It’s a story in which the mysterious processes of psychological healing are made visible — a psychological thriller, especially for fans of India fiction. It is also a love story of an unconventional sort, a tale critics have called unsettling, mesmerizing, delicious, and enthralling. Most of the family had no idea that Bhushan had grown to have serious intention. If they’d learned, I would have lost my welcome. And had Bhushan followed me then, he would have lost both his family and his place in the world. But how was I to resist? He was charming; he had the ease of a young prince. Better if Bhushan too had remained content with nothing more than his late night visits to my room. Hours after the house was still, he would tiptoe in, crawl beneath the veil of mosquito net around my bed. So many nights on that narrow charpoy we whispered and wound round each other in darkness. Usually, he was quick, muffling his cry in the pillow. But often he brought fresh flower garlands, and the smell of wet roses and jasmine announced him. In the dark, he would pile them around my face, on my hair, or trace my breasts and the length of my body with the tips of damp petals I can still smell. In my bedroom the only window opened onto the gali and if the moon was strong, my flesh had the color of dirty soap. Bhushan, so dark, was invisible. Even now, so many years later, I think I would know his young man’s body by smell and feel; yet even at the time I might not have recognized him naked by sight alone, other than his head and hands, his lordly stance and walk. In the days and evenings, at work in the restaurant and at the table with the family, he and I were easily jovial, like playful brother and sister, talking about nothing, in English and soon in the Hindi that I was grateful to learn. The new language flooded in— I felt it remake my mind. I seemed to know only what I had learned to speak of in Hindi, the words I needed for that day. Nothing else existed. For more than a year, our playfulness together, his and mine, was an easy disguise because our hearts were so light. I rode to work in the mornings seated behind him on his motorscooter. At night we would both read Indian Express, swapping sections back and forth, while his mother and his father’s ancient aunt did their stitching, talking in a dialect I never learned, and the men read Hindi newspapers and financial reports. Then the two of us ventured to see Bhushan’s cousin play cricket and failed to return home immediately afterward. I watched his mother draw herself up in scowling disapproval. We didn’t take such risk again. What we had to hide was our nighttime meetings, and how Bhushan was changing.